In 100 Days A New Jewish Elite Rises Under Trump | Have Ye Not Read? But hey, those Jewish Christ-haters are certainly better than the Muslim Christ-haters we had under Obama, right? Joh 8:46 Which of you convicteth me of sin? And if I say the truth, why do ye not believe me? They weren’t of God then, because they rejected the Lord and Savior. And they’re not of God now, because they STILL reject the Lord and Savior. And now we’ve got them BOTH, folks. We’ve got the Jewish Christ-haters taking power in this country, and we’ve still got the Muslim Christ-haters pouring in under cover of darkness. Two tons of fun, for the price of one. What most people are completely oblivious to is the fact that the Jewish Christ-haters were the ones who pushed the immigration laws through Congress allowing the Muslim Christ-haters to come streaming into our country in the first place. And then, when the Muslim hoards — err, ah…excuse me…immigrants — began physically attacking Christians, not just here in America, but in Europe as well, these very same Jews bragged openly that this was “God’s punishment” on western Christianity for our “anti-semitism.” Don’t believe it? See The Hidden Jewish Hand Behind the Muslim Invasion of Western Christian Nations. What ever happened to the idea of Christians running their own country? I suppose I’ll be called “anti-semitic” for asking. But really? Does anyone have an answer to that question? If Christians are not even to go to court against each other because the courts are stacked with judges who are unbelievers (I Corinthians 6:1), what are we doing hiring these same unbelievers to make the laws in our country? Funny that in Israel the Jews openly and without apology prevent the “wrong” kind of immigrants from getting in. And they do so by using both a big wall AND some of the world’s most restrictive immigration laws. But that’s not our business. Here, we have to open our borders and let the heathen enemy pour in. It’s “the law of the land.” Apparently, they passed a national suicide law when we weren’t looking. 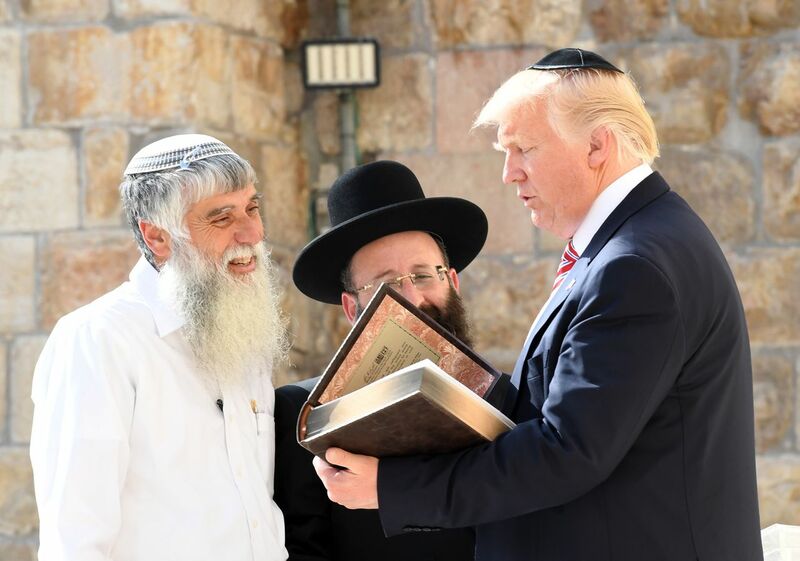 “The new leaders representing American Jewish interests in the White House are keen to shape policy on education and religious expression and to ensure a pro-Israel stance more in line with the Netanyahu government. Ahh, yes. Think about it. The Trumpster is “becoming strong with a small people” (Dan. 11:23). He’s loading his cabinet with neo-con warmongering orthodox Jews and globalist orthodox Jew bankers. Anyone waking up, at all? Dan 11:21 And in his estate [i.e., in the estate, or “office” of the raiser of taxes of the previous verse] shall stand up a vile person, to whom they shall not give the honour of the kingdom: but he shall come in peaceably, and obtain the kingdom by flatteries. That’s right. He didn’t win the popular vote. Half the country considered him too vile to hold the presidency. Quite literally, the majority of voters didn’t want him. But he got into office any way, thanks to the peculiarities of the electoral college. And we had a “peaceful transition of power,” as the newspapers repeatedly reminded us. And how did he win? Through flatteries, which means, in the original Hebrew, through smooth-talk. Dr. Moffat, in the Moffat Bible, translates the phrase “crafty promises.” Yep. He promised to “make America great again.” He promised to fix everything. Indeed, he said our country would start “winning” again, and that we’d win so much we’d actually end up begging him to stop all of the winning. He said (see video here) we’d win so much, we’d be pleading with him, “Please, please, Mr. Trump, no more winning. I just can’t take all of this winning. It’s too much.” Crafty promises, alright. It’s almost comical, now, looking back on it. He assured us he knows it all, through his vast business experience, better than anyone. And he promised he’d put everything right again if we’d just elect him. And it will be YUGE! And next thing you know, there went Christian nationalist Steve Bannon (who previously had called on Christians to conduct a “Christian holy war” in order to get Trump elected). And there went all of the other Christian nationalists who helped Trump get elected — each one replaced or put under the thumb of Trump’s Jewish son-in-law, and Netanyahu’s life-long family friend, Jared Kushner (owner of the most expensive piece of real estate in America, located at 666 Fifth Avenue in New York), along with a cornucopia of other orthodox Jews, including Trump’s Jewish daughter, Ivanka, who as Kushner’s wife had to renounce her Christian faith and embrace Judaism in order to marry the man. They money’s really going to flow, folks. “Prey, plunder and property,” it says in the original Hebrew (Moffat translation). None of this prey, plunder and profit is going to go to you, or me, of course. It’s all going to the small people — the “new Jewish elite” — that the Don is in the process of becoming strong with. He’ll bomb Syria for them. He’ll fight North Korea for them, in order to prevent North Korea from giving Iran the bomb. He’ll fight Iran, too. Iraq. You-name-it. Whatever that “small people” want, he’ll get it done. He’s their man. Just you wait and see. The bottom line is that it’s really going to get interesting now, from this point forward. So keep your eyes open. Follow the Bible. And think. If Daniel 11:20 was indeed about Obama, prophetically, then who is the guy in Daniel 11:21 who rises up in Obama’s “estate,” which is to say, in Obama’s office? Are you thinking? Sometimes the things we’ve been taught over the years turn out to be just a little bit different than we might have once believed. Once the prophesy actually starts coming to pass, the reality opens up. And we have to accept it for what it is.